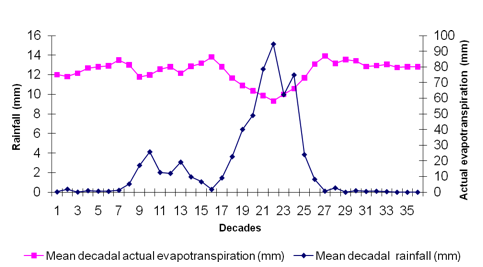 Rainfall in the area around Mekele traditionally comprises a small rainy season from March-May (Belg) and a stronger rainy season mid-June to September (Krempt). Communities in the area around Mekele report that increasingly the Belg rains fail to arrive, and the Krempt rains are more variable and tend to arrive later than they used to. The cumulative effect of this is that the length of effective growing season is shorter and communities have had to turn towards crops with a shorter growing season, such as Teff. The failure of the Belg rains can lead to drought and crop failure. Further information on the ENDA Communities website.